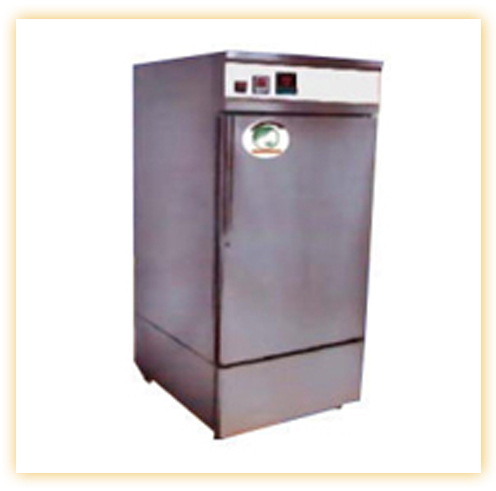 We manufacturer and export Industrial Deep Freezers. Applications : Equipment specially designed & suitable for Electronic Industry, Space Programs Research, Research Labs, Defense Labs, Blood Banks, Biological Specimens, Serum, Vaccines, Research Laboratories Medical Specimens, Clinical Samples, Industrial research etc, for testing under extreme low temp. conditions. Construction : Fabricated on heavy angular structure, triple walled chamber, two chamber of AISI S.S 304. The exterior chamber from CRCA Sheet duly powder coated with PUF insulation. Door : Double door for vertical models only. ,first one of 6 mm acrylic & the second one of metal with two walls & PUF insulation. Top opening single door for horizontal models. Refrigeration Systems : A suitable capacity hermetically sealed compressor with cooling coils, condensing coils, fan motor & electrical accessories are incorporated for bringing down the temp. to required level. Temp Control : Digital temp. Control with 24 hrs timer. Optional : Micro processor based temp. Control with PC interface & strip Chart Recorder. Safety Measures : Built-in temp. deviation audio/visual alarm. Safety thermostat for over shoot temp. cut off safety circuit to cut off the whole system in case of malfunction (Only applicable in microprocessor based models). HRC fuses for compressor heaters & mains, time delay circuit for safety of compressor etc. circuit breakers for over & under temp. Conditions. Special Attention : Must be kept in a A. C Room & suitable rating Servo Controlled Voltage Stabilizer is recommended.